What lies behind a learning technology project? What are the steps involved in taking a project from initial idea through to delivery? In this post Pete Sparkes’ shares some insights to his role as a Learning Technologist by taking us through his involvement in a recent initiative designed to further enhance mechanisms to support student engagement here at the University of Sussex. The brief for this project was to produce a bite-sized, fully online course to be delivered to 200+ newly appointed student representatives. 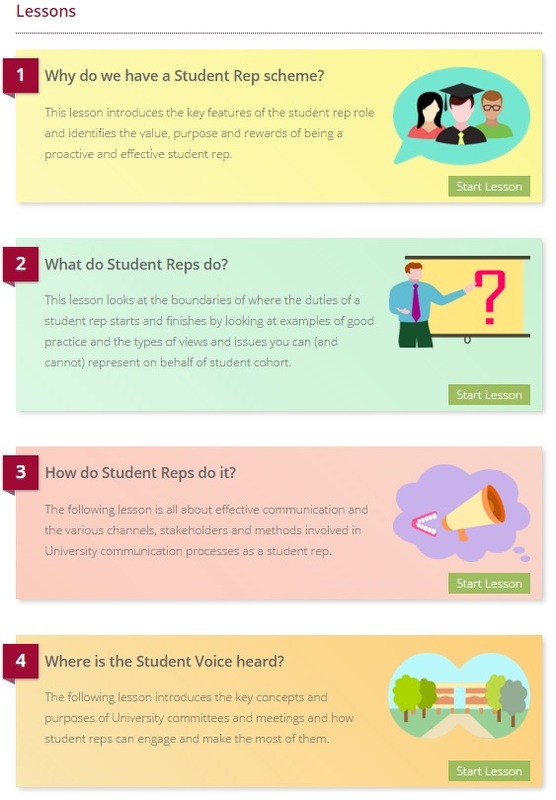 It was anticipated that moving from face-to-face workshops to a fully online solution would encourage participation by allowing reps to work at their own pace to complete training, and as a result deliver a stronger student rep programme. For this collaborative project I provided input on instructional design, advice on the use of appropriate technology and the structuring of course materials. Colleagues from the Student Rep team in the University of Sussex Students Union (USSU) and University’s Academic Development and Quality Enhancement Office provided a brief, acted as subject matter experts, and reviewed and tested the course prior to its official launch. Why do we have a student rep scheme? How do student reps do it? Where is the student voice heard? I used these questions to form the basis of an overarching structure to frame the course content evenly into four bite-sized lessons. Chunking information makes it easier for student to retain and digest information within an online course – as it provides clear scaffolding for learners in an environment where they are given the freedom to work at their own pace. It can be used to present a range of text, graphic and multimedia based materials. It has features for creating and facilitating online learning activities, self-paced study, assessment, discussion and collecting feedback. 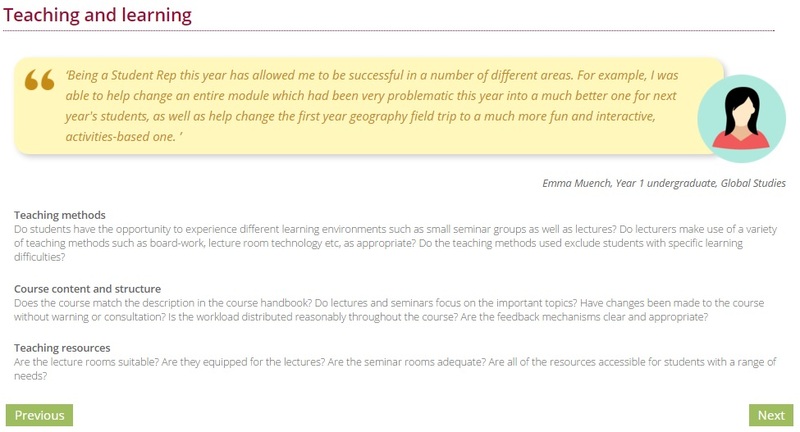 The ‘lesson’ activity in Study Direct (Moodle) was used as the primary tool for developing the course content. This allows tutors to present text, image and multimedia content within a series of webpages combined with quiz type questions. The content can be structured in either a linear fashion or adaptive to choices made by the student which makes it ideal for facilitating self-directed learning. Student Rep training used the lesson tool to present content, activities and questions which could be navigated through using previous / next buttons. A full navigation menu is made available to students upon completion of the lesson to make it easy to refer back to content. A mix of multiple choice, true or false and matching questions were used to assess students’ understanding and record progress throughout the course, this included 3 – 5 questions per lesson based around the learning outcomes. 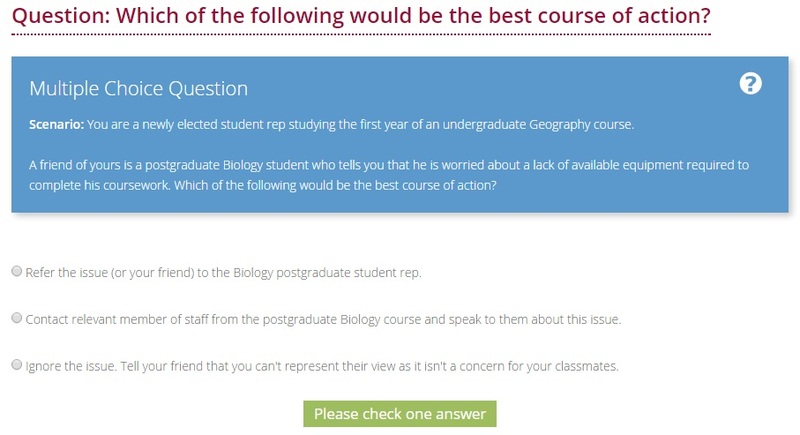 I chose to use a small number of questions which could be automatically graded as time and efficiency for both staff and students was an important factor in the course design. The questions were written to frame key information in the context of real-world scenarios in order to assess understanding and application of knowledge rather than serve as a memory test as typically associated with multiple choice questions. Each question included a feedback response to explain and reinforce a concept when a correct answer was selected or to provide hints and links back to relevant sections of course material for review when a wrong answer was selected. A small number of online discussion forums were used to encourage sharing of ideas and best practice between reps. In order to aid facilitation of discussion, each forum had a specific discussion point and they were strategically placed at relevant points in each lesson so that students had the opportunity to focus and reflect on key concepts and how they might apply their own ideas. To recognise completion of Student Rep training, open badges were created to complement the existing reward and recognition Student Reps’ point scheme. Open Badges are digital tokens which are useful for credentialing skills and experience which aren’t recognised through formal qualifications. They can be embedded into personal web-pages, portfolios, CVs and professional networking websites – e.g. LinkedIn profiles. All reps that complete the online training with a 100% score for all four lessons will be issued a badge, through Credly, to recognise this achievement. A survey has been added to the training course to gather feedback from student reps to gauge opinion on whether the course met expectations, was the appropriate length, contained relevant content and to identify any positives and negatives which participants experienced. This information, along with Study Direct data reports of interactions with the online lessons will be used to review and improve the course for future student reps.